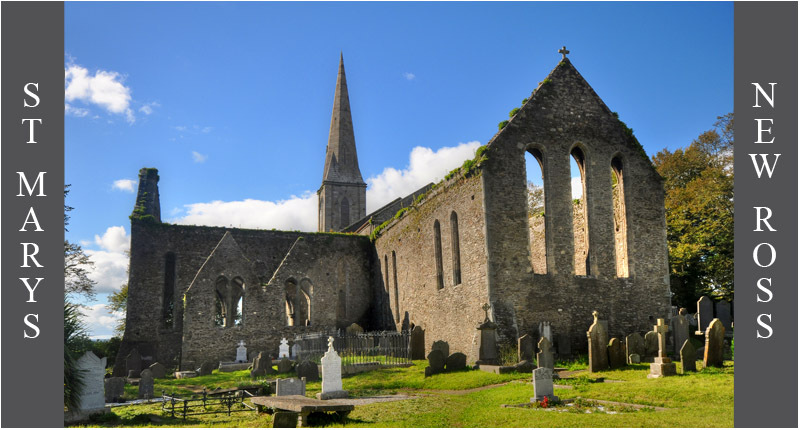 William Marshall or his wife Isabella, who developed the town of New Ross, founded the Parish Church of New Ross in the 13th century. 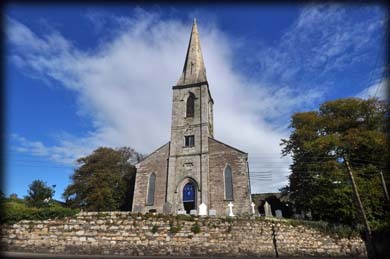 The church is situated on a rise overlooking the town. 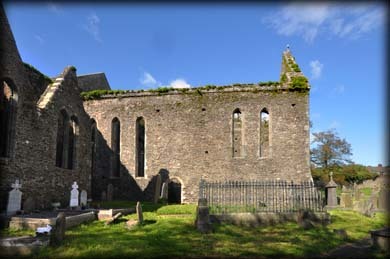 It may have become a Diocesan Centre under Bishop Barret, who built a castle at Mountgarret. 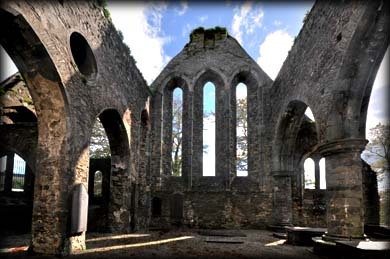 The nave of the church was knocked down in 1813 and the site is now occupied by the present church. 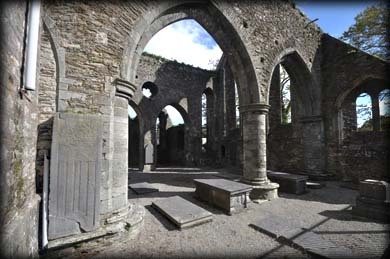 The old chancel and the north and south transepts contain one of Ireland's largest collections of medieval funerary. A key to these ruins can be obtained with a deposit at the town hall on the corner of South Street and Quay Street. The entrance to the chancel is in the north wall. There are three superb lancet windows in the east gable, pictured below. In the north wall there are two lancets and three more in the south wall. Located in the chancel are various medieval cross slabs and in the north wall there is a beautiful tomb canopy and niche. Under the tomb canopy are two graveslabs. One of them is known as the 'Bambino' stone and features an effigy of a swaddled baby between two adults. One of the slabs features a cross with a projecting Agnus Dei, Lamb of God. These are usually associated with a Templar burial. Also present in the south wall is a sedilia. Pictured above are, the cross slab with Agnus Dei symbol, two more cross slabs and the Bambino stone. The entrance to the south transept is at the northern end of the east wall. This transept has two side-chapels on the east wall. 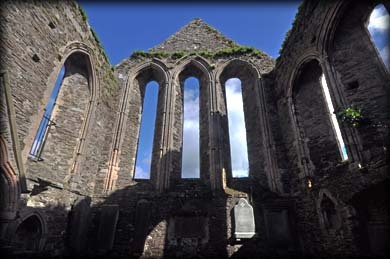 The south wall has three lancet windows, pictured left. 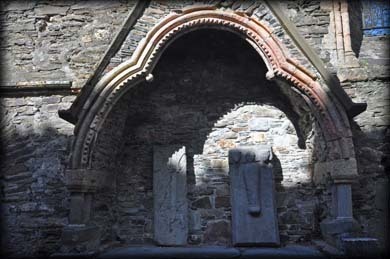 Two arches connected to a western aisle. 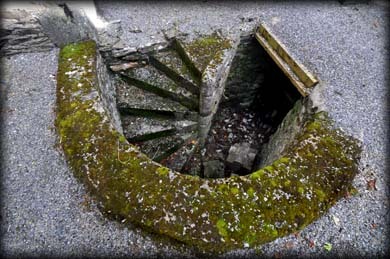 There is a newel stairs that led to a barrel vault. This was later used as a mausoleum for the Tyndall family. There are some more superb cross slabs to be found in this section of the ruins. On the ground lies a stone coffin, pictured below, and attached to the north wall is another tomb effigy. It is of a man wearing a long tunic, his right arm bears a gauntlet and his left holds the cord of his tunic. The north transept is entered through a doorway in the east wall. 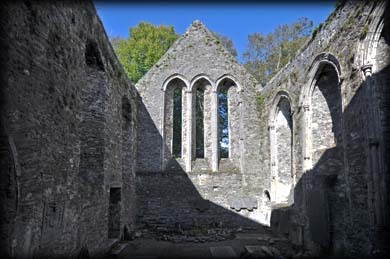 The north wall features three lancet windows, pictured left. These like the windows and doorway in the chancel are dressed in Dundry stone. 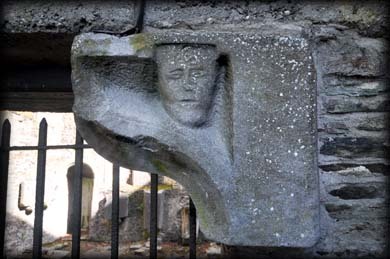 In a niche in the northern end of the east wall is the headless effigy pictured below. There are four lancet windows in the east wall and a fine heraldic panel. There are some lovely examples of stone carvings dotted around, these include a nice wall monument on the north wall and an incised drawing of a ship on the west wall. I would strongly recommend a visit to St Mary's if you are interested in medieval funerary. Situated: In a rectangular graveyard on the north side of Mary Street Upper. From the Tholsel (Old Town Hall) on Quay street head west up the hill on Mary St before turning right onto Church St. Discovery Map 76. S 7210 2770. Last visit Sept 2015.